Imagine cutting your home grown apples in half, revealing a pink marbled flesh inside! Now you can with new early garden variety Apple 'Rosette'! It's true, the lovely pinkish red marbling of the flesh runs right to the middle. It is an easy to grow tree, with good disease resistance, and early fruiting in October. Imagine cutting your fresh home grown apples in half, revealing amazing pink marbled flesh inside! 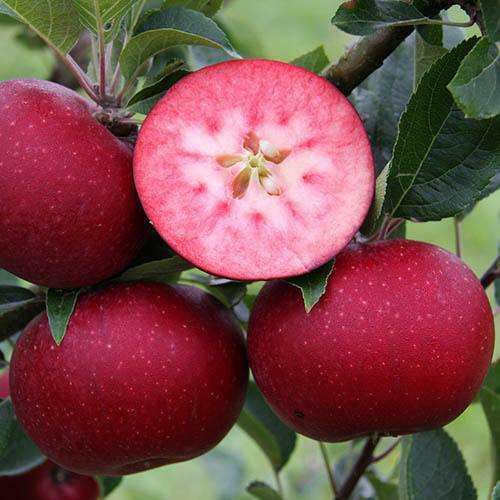 Now you can with new early garden variety Apple 'Rosette'! It's true, the lovely pinkish red marbling of the flesh runs right to the middle. It tastes juicy sweet from the tree, but because of it's colour, show it off sliced in fruit salads, or make an amazing pink apple juice from it. It does not turn brown once sliced like other apples do, so be creative when using it. Pink apple sauce maybe or lovely with creamy cheeses?! It is an easy to grow tree, with good disease resistance, and early fruiting in October. On MM106 root-stock it will reach 10-12ft in 10 years, as it is quite a slow grower. It is not self-fertile, but if there are apple trees nearby it is likely you will get some fruit as it can be pollinated by a wide range of commonly grown trees. Produces heavy crops from a young age.